My Peony tutorial would be a mix of technique. I am used to make peony flower without cutter or mold. But, I just found out that if you want to make the flower for special event like wedding cake probably cutters and molds will give you a better result. So I decided to write the tutorial without cutters and with cutters which was done by others. Firstly, choose your material. Clay or gum paste is ok for this project. You can make your own clay like cold porcelain or soapy clay or buy ready-made clay from craft store. I would say soft clay like those from Martha Stewart is easy to handle for making flower without cutter. Let's start by rolling the clay to 10 balls with diameter about 2 centimeter and another 10 balls with diameter about 3 centimeter. 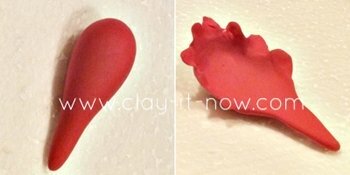 Use pink color clay for more natural and sweet looking flower or red clay for stronger present. Change the shape of the above to teardrops with length about 5 - 7 centimeter. Press the larger end of the teardrop with your finger to form the petal. You can do it on the flat table surface or on your palm. Next, create the frill effect on the petal by pinching the outer edge of the petal, pull it out a little bit to make it thin and then slight twist the edges. Do this for all the 20 petals. Then, curve the petal inward by pressing the middle of the petal with you index finger. Take 5 smaller petals and overlap each other and close it up to form a center of the flower/ the bud. Add the other 5 small petals, paste it on to the center of the flower, keep overlapping to each others to about half of the petal. Attach the other 10 big petals the same way, maintain the height to be more or less the same as the center/ bud and arrange the petal until you are happy with it. And, it's done. 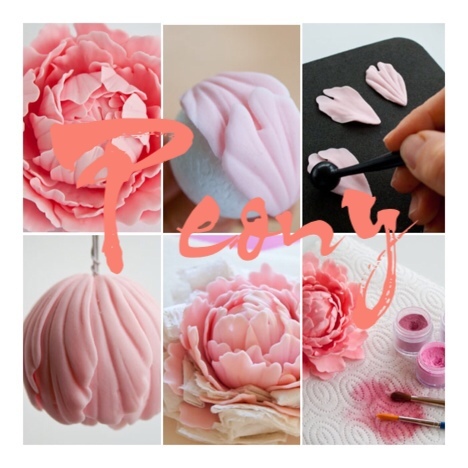 Louise from Cake Journal has peony tutorial detail which I think would be useful for you too. Have you done any clay flowers? 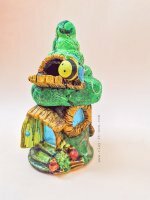 Would you like to share your works with us? Please send your picture using the submission form here or upload the picture to our Facebook page.